This is an authenticated Sears model No. 229. "Sears Roebuck" is listed as the architect on the building permit. 5926 N. East Circle, Chicago. No. 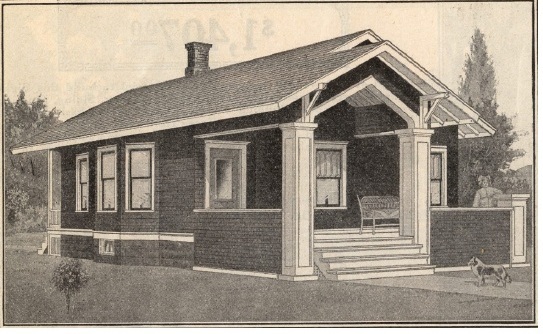 229 from the 1914 Sears Modern Homes catalog. Actually it was called No. 264P229 that year. The Model No. 229 on East Circle was built in the fall of 1913. Model No. 229 was offered from 1913-1916, and in later years the floor plan changed and the house was called the Somerset. The front door of the house is on the same side of the house as the dining room, which is another clue that it was a very early version of the No. 229. This isn't a model you see every day! 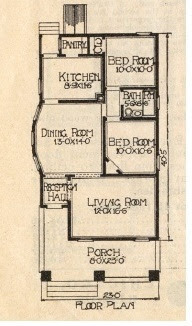 Floor plan from the 1914 catalog. The front door is on the same side of the house as the bay window. The original owner was Otto Hannelman and the carpenter was W.G. Stoll. Hannelman paid $2,400 for the house, including labor. Sometime in 1919 or early 1920, William and Emma Foerster moved in. William was a mail-order clerk with Marshall Field & Company. The Foersters were still in the house in 1923. But by 1928, Rosalie Stier was living in the house. I just found your blog, and I love it. I live in Oak Park, and so many of the Sear Catalog pictures look like homes in Oak Park. Do you know of any confirmed kit-built homes in Oak Park? What is a good book/resource you use to find Sears homes. I found the archives of the home models, but is there a book that has them all listed with pictures? "Houses by Mail" by Katherine Stevenson and H. Ward Jandl. Should be in your library.